If you are like most people, moving home stresses you out and you tend to leave random boxes and piles of stuff here and there during the process. These tips show you how you could use your garage as a storage solution to help you organize your move into a stress-free event. First, organise your garage. Throw away stuff that has been collecting dust for years, if you haven’t used it for five years, you probably are not going to use it for the next five! Arrange things that you are using and will use in the near future along the wall of the garage. 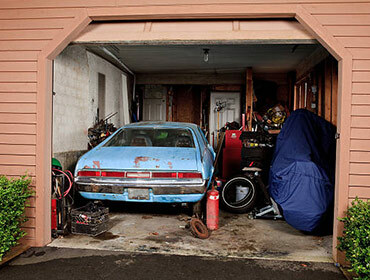 Organising your garage into “zones” also helps in the moving process. One zone for everyday things like your keys, winter jackets that tend to pick up cooking odours if left in the house and shoes. One zone for sports items like ski equipment, bikes etc, one zone for your maintenance supplies like shovels, lawn mover, rakes and seasonal items. Just like location, location, location is the hallmark of real estate, Labelling is the hallmark of moving. Label every box, every plastic bag filled with things so that you never have moments of panic wondering for the 100th time, if you packed your expensive bowls or did you leave it as a surprise gift to the new owners?? Paid storage solutions are great, but also don’t forget that your garage is such an incredible free space to put your boxes. Just park your car outside for a week and load your garage with all your things. This will make for easy transport too for both the moving company and yourself. Another great point of filling the garage with neatly packed boxes, is the sense of accomplishment you feel knowing that the house is safe and decluttered for your family to say their goodbyes to this house that has given them such wonderful memories!